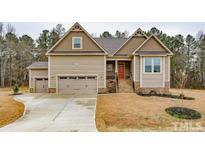 Below you can view all the homes for sale in the Sunset Ridge subdivision located in Clayton North Carolina. Listings in Sunset Ridge are updated daily from data we receive from the Raleigh multiple listing service. To learn more about any of these homes or to receive custom notifications when a new property is listed for sale in Sunset Ridge, give us a call at 919-759-5792. Bed & full bath on main for guests, while upstairs, large master has ensuite tile bath w/ soaking tub & large walk in closet w/ its own access to laundry! MLS#2243425. 4937. Great location and highly rated schools. MLS#2237719. 2531. Dining Room w/Coffered Ceiling! EcoSelect Certified! Crawlspace Foundation! MLS#2214680. 1128. Family Room: Granite Srrnd Gas Log FirePlace, Recessed Lighting, Open to Dining w/Bay Window! EcoSelect Certified! MLS#2214677. 1128. Family Room: Granite Surround Gas Log Fireplace! EcoSelect Certified! MLS#2205324. 1128. EcoSelect Cerified! Covered Deck & Grill Deck! MLS#2190964. 1128.